If you have an iPhone, chances are, you often use it when you are driving. Whether it is for making calls, listening to music, or retrieving directions to your destination, it can be useful in more ways than one. To be safer and for your convenience, it would be best to connect your iPhone to the stereo system of your car. This will make it easier to have it controlled and to access the files that you will need. This is actually a simple task. You do not need to be a pro to figure out how to make the connection. Keep on reading and we’ll share with you some tips on how this can be done. Connecting iPhone to Car Stereo: How To Do It Right? There are many ways by which it is possible to have your iPhone connected to the stereo system of your car and one of the easiest and most common is perhaps through Bluetooth. This is excellent because it makes you take advantage of wireless technology. This means that there is no need to be dealing with tangling wires. You just have to make sure, however, that your car’s stereo has Bluetooth compatibility. With your phone turned on, simply open the Control Center. Once the Bluetooth is turned on, you now have to make sure that the Bluetooth of the stereo is also on. Refer to the manual from the manufacturer as the instructions can vary depending on the specific brand and model that you are using. Once they are already paired, you can now stream music wirelessly. However, one important thing to note is that this way of connecting can consume too much of your phone’s battery, so you might want to consider another alternative. This is one of the most traditional ways by which you can connect your iPhone to your car stereo. In most modern cars, the stereos are already fitted with an iPhone input jack. If there is no input jack, you can have one installed. Simply connect one end of the USB cable on your phone and the other end on your stereo. If your car stereo has a screen, you will most likely be able to use it to control how the phone is going to be used, such as in choosing the songs that you want to play. Otherwise, you can always use your phone to choose the songs you want to hear. 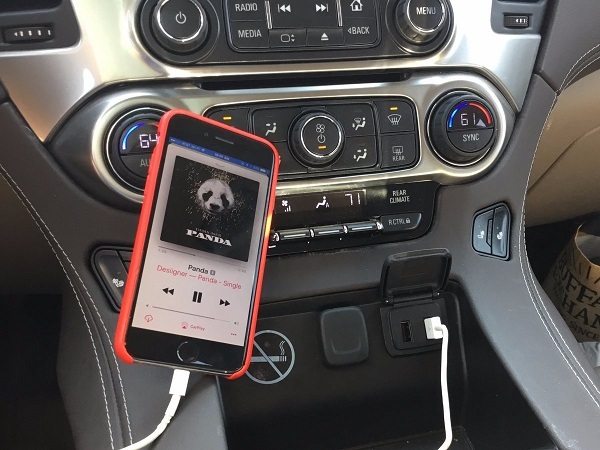 One of the best things about this method of using your iPhone to be connected to a car stereo is the fact that you can charge your phone at the same time, making sure that you battery will not run out. If you have an iPhone 5 or newer models, as well as an iOS 7.1 or newer versions of Apple’s operating system, you can use CarPlay as a way to connect your phone to your car’s stereo. This is an iOS connected system, which has been developed by Apple to be able to give their users more ways on how to use their phone while driving. Aside from playing music, it will also allow you to reply to text messages and to use various apps. Keep in mind, however, that this feature is available only in some cars. Amongst the options that are currently available, the Pioneer CarPlay system is one of the most favored. It is sleek and stylish, making it able to add a hint of sophistication in any car. It comes with a touchscreen display, making it easier to have it controlled. With this replacement to your original car stereo, you can easily connect your iPhone and talk to Siri. You need to have your phone plugged in the stereo system in order to stay connected. We are living in a technologically-advanced world and people are creative. One will surely be able to think of new ways to connect your phone to your car stereo. In some cases, you do not have to replace the stereo that you currently have inside your vehicle. For instance, you can buy a Bluetooth adapter. Even if your car has no built-in Bluetooth, with the adapter, you can easily make a wireless connection to your iPhone. There are also cassette adapters, which are perfect for classic cars with old radios. Connecting your iPhone to your car stereo does not need to be a complicated task. It is very basic and within a few seconds, you can already use your phone in more ways than one. It is not only for listening to music. It keeps you entertained, connected, and safe. Regardless of which one you choose, you can expect that the earlier mentioned solutions will work. Just make sure that your phone and your stereo are compatible with each other.